Islamist guerillas in SA’s neighbour are creating mayhem with machetes, and could grow into an even more perilous threat. Since mid-May, 35 people have died in a series of brutal attacks. Various people have been beheaded, hundreds of houses have been burned and residents have been advised to be cautious. On 8 June local staff at Anadarko, an international oil and gas company, refused to go to work because they feared an attack. The company then asked its foreign staff not to leave their compound. The US embassy also asked its nationals to leave the province immediately. There are economic as well as religious and security issues at play. Cabo Delgado province borders Tanzania and is home to 2.3 million people, 58% of whom are Muslim. In the past few years massive oil and gas reserves have been discovered. These resources are set to lead to the development of a multibillion-dollar industry in Cabo Delgado, and a rosier future for Mozambique’s economy as a whole. The birth of Al Sunnah wa Jama’ah is very similar to what was seen with Boko Haram in Nigeria. It started as a religious sect which transformed into a guerrilla group. Al Sunnah wa Jama’ah is Arabic for “people of the Sunnah community”. The group is also known as Al-Shabaab (The Youth), even though it has no connections with the Somali movement of the same name. It is estimated that the movement now has between about 350 and 1,500 members who are organised in tens of small cells along the coast of northern Mozambique. The sect’s initial goal was to enforce sharia law (Islamic law). It tried to do so by withdrawing from society and the state, whose schooling, health system and laws it rejected. Such posture led to much tension. Some suggest that the movement also calls itself “[Swahili Sunna]” (Swahili path) to reflect a dream to restore the Swahili grandeur of the 19th century when sheikdoms and sultanates dominated the area. Despite the movement’s lofty ideals, some analysts still argue that it is motivated by greed rather than grievance. The group is even said to have become involved in illegal mining, logging, poaching, and contraband, making millions of dollars a week through these criminal activities. But these assertions are not backed by hard evidence and it’s difficult to imagine that a guerrilla group that makes 3 million US dollars a week still fights with only machetes and very few guns. The genesis of the current crisis has its roots in the militarisation of the Al Sunnah wa Jama’ah in 2016. In that year, tensions with other Muslims and the state increased and the movement began to prepare for armed action. In October 2017 a group of 30 men attacked three police stations in Mocimboa da Praia. They killed two policemen, stole arms and ammunition, and occupied the town. Promising not to harm the residents, the guerrillas eventually withdrew to set up military bases in the forest. Some scholars have suggested that the group is part of a broader international Islamic terrorist network. It is true that there are cross-border linkages at play: Mozambique’s police have said that the guerrillas received military training in Tanzania and the Democratic Republic of Congo. But I would argue that Mozambique’s new guerrilla movement is primarily a local phenomenon with very specific historical and social dynamics. The movement emerged within a particular religious, social and ethnic group known as the Mwani. They feel they have been marginalised for decades by migration into their area, a lack of economic development, and their neighbours’ political clout. Ultimately, if the movement sustains its current levels of violence, oil and gas majors might move oil and gas processing plants offshore. This would probably lead to a loss of jobs locally. Ongoing violence could also lead to a displacement crisis as hundreds flee the area to escape the violence. 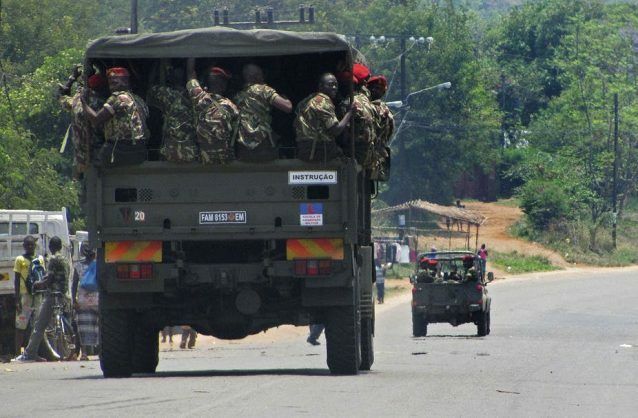 The Mozambican state has responded to the latest crisis by entering into security agreements with the governments of Tanzania, DRC and Uganda; by setting up a regional military command; and by moving more troops into the north. But the state and its partners need to also devise non-military measures. They need to constructively engage with issues of land ownership, begin to address sectarian tensions, and avoid vexing Muslims in their security operations if they want to prevent the Islamist guerrillas from tapping into local grievances and gaining more ground.